A legend for club and country, former Cologne star Lukas Podolski bid an emotional farewell to the German national team in March. The Billy Goats have endured a tough start to the season, picking up just a solitary point from their first seven outings in the Bundesliga, and losing back-to-back games against Arsenal and Red Star Belgrade in the UEFA Europa League. A far cry from the enthusiasm of last May, when they finally brought an end to a 25-year absence from European competition. "Nobody expected a start like this," Podolski told Cologne-based newspaper Express. "It's pretty alarming. If you only have one point after seven games in the Bundesliga, then clearly things aren't going as well as in previous years." "I'm delighted that he's here," he enthused. "He's 39, so I know I've still got a bit of time before the Effzeh door closes on me! I played with Claudio for a long time with Bayern, he'll definitely help Cologne. He's strong, he makes good runs and he has a killer eye for goal. He's a clever striker. He's also a great guy, very polite. I think he'll be a perfect fit for the club." 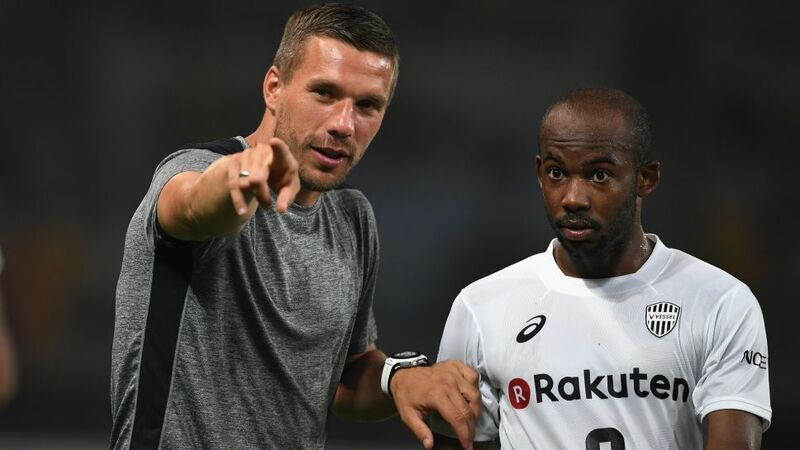 Podolski would certainly be given a hero's welcome were he ever to return to the club he joined as a 10-year-old in 1995, and which later propelled him into the Bundesliga limelight. For now, though, he remains a staunch supporter from distance. "It's been an unfortunate start, but I'm not worried. As Claudio Pizarro has already said, they just need to win one game. They've clearly had some bad luck, and sometimes the ball just doesn't seem to want to go in. But I'm not looking at a team that's collapsing, which is a positive thing. They are fighting, they have the right attitude, they're not looking for excuses. And that's why I feel good." Bayern have also had an unsettled beginning to the campaign, with Jupp Heynckes being called out of retirement to replace Carlo Ancelotti in the hot seat after a series of disappointing performances. Podolski, who spent three seasons in Bavaria, believes the 72-year-old is the right man to steady the ship. "If the rumours are true, and there was genuinely unrest among the squad, then Heynckes is the right man for the job. He is extremely calm, both as a coach and as a person. You feel good playing for him. He also has a fun side, a bit like Peter Stöger in Cologne. I trust him with Bayern." Podolski was also quick to congratulate Joachim Löw as Germany reached the 2018 FIFA World Cup with a 3-1 win over Northern Ireland. The Poland-born striker represented Die Mannschaft at youth level before embarking on a dazzling international career, with 49 goals in 130 appearances. After Germany's triumph in Brazil in 2014, he went out with a bang in March 2017, scoring a stunning goal in his retirement game to earn Löw's side a 1-0 friendly win over England. "It's a great achievement to have qualified with nine wins," he admitted. "The guys who have joined the squad are doing really well. We are spoiled in Germany, if you look at the level of the team over the past few years. You can count our defeats on one hand - even if there's a national crisis every time we lose! But this tournament will be something else entirely." Germany's former No10 agreed that Löw will have no shortage of selection headaches before heading to Russia ("this will be very hard for him, and a very tough fight for the players! "), but believes the national coach will find the right solutions as his side look to become only the third nation, after Italy and Brazil, to win back-to-back World Cups. "One of Jogi's great strengths is that before every tournament, he gets very focused on details and always looks for new ideas. I think the character of the squad is another big plus. There are no idiots in the team, and the staff and organisation have been the same for years. Every player in the national squad feels good, which isn't necessarily the case for every country." And what of Podolski himself? His new club, Vissel Kobe, have ambitions to become one of the top teams in Japan, and while he admits that it is still a "work in progress", he has every intention of helping them climb the ladder in the coming years. Who knows, though - perhaps one day 'Prince Poldi' may be tempted back to Germany to shepherd the Billy Goats to more Bundesliga success. And this way for all the latest on champions Bayern Munich!